So, I have had a few days to think about what I think about Noah. First thing to say is that this is not a review – because I have no qualification to review anything really. Also reviews tend not to include spoilers AND HERE BE SPOILERS so leave now if you would prefer. You can certainly see where the money went. The special effects are great, the animals, the ark, the flood sequences are all suitably epic. Acting wise, well I rather like Russell Crowe. 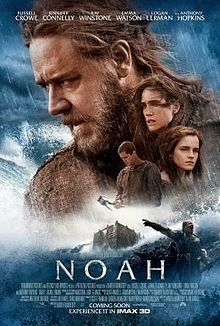 Noah was a complicated man and if the portrayal sometimes tips into completely raving mad, then I’m not sure it is his fault. Although I think he was more into portraying the getting slaughtered on wine and then getting naked more that the essential greatness of the man to do what he did. Emma Watson plays Emma Watson very prettily. Douglas Booth plays her love interest (Possibly Shem – I got a bit mixed up.) He has outstanding lips. Jennifer Connelly as Noah’s wife/partner/rubbing rag is great. She gives it heart. She made me cry. Don’t come to this expecting a direct Biblical account. Someone somewhere lost their nerve I think and there is a lot of preposterous flimflam about The Creator (cue wooey-wooey spooky music) But I did like the ecological view about man messing up a beautiful earth. For me there were three main problems. I suppose because it is a 12A certificate you are a bit limited in showing the extent of the fall of man that led God to wipe them out. Consequently, it seems that God did what he did because man turned away from vegetarianism and Ray Winstone was a bit free and easy with a pointy axe when it came to people’s heads. BIG SPOILER. Ray Winstone sneaking onto the Ark. Noooooo! Unacceptable. No. The shutting of the ark door signalled the end of the old world. Bridge too far for me. By trying so hard not to put too much God into it, the film has lost its heart, it’s centre. The Noah story is about God as well. God’s relationship with his people. And it is a relationship. The lack of God is really a big hole and I don’t mean that as a Christian thing. It is a story with the absence of its main character. Despite all this, I did like it quite a lot. It is a bit weird really but immense in scope and it is what it is. Suspend your sensible thinking and give it a go.